Well, no picks this week. This was more of a “special episode” focusing on the iPod announcements. From the cheap seats, the new Nanos looked cooler than I originally thought, and I’m not sold on the iPod Touch yet. Guess we’ll have to wait and see what the final device has when it ships. What do you think of the new goods? What’s good, bad, or ugly? 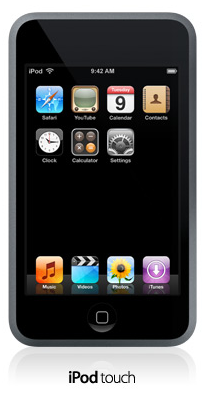 The iPod Touch is ugly… I thought the iPhone was kind of silly with the missing bottom row of buttons. But the Touch barely has any icons! I didn’t care for the Nano when I first saw the leaked pictures on Engadget, but it’s since grown on me, to the point that I have a silver 8GB one on order. I’m not sold on the iPod Touch because I didn’t see the email app, or a todo list, or a text editor – kinda weird. Why not just build in the rest of the PDA functionality – the contacts and calendar are already there. It looks cool, but with wifi – it should do more, right? Maybe by the time it ships, it will all be built in. Waiting for a hack is an option, but the idea of spending $400 to start duct taping stuff together to “kinda/sorta” work makes me nuts. I suspect that by Leopard there will be a few more apps on these devices. We are sure to see Notes since it’s an integral part of Mail.app. As for the “missing” icons on the devices. The new iPod Touch will have games. No doubt. So it’s safe to assume that buttons will appear for those. It’s also safe to assume that games that work on the iPod Touch will work on the iPhone as well.